President Trump was reported on Monday to have invited Putin to the White House. The date is assumed, as usual, to be negotiated through diplomatic channels. Putin doesn't object. There is much to be discussed. But the US rolled out new sanctions on Friday, affecting dozens of Russian businessmen, officials and companies. These two things are hardly compatible. You either cultivate relations or destroy them. Nobody has managed to do both yet. Our correspondent Alexander Khristenko is reporting from Washington D.C. about the inconsistent USA. This extension of the blacklist is the biggest since the USA imposed sanctions on Russia 4 years ago. As many as 15 companies and 26 persons were included in the stop list. Today, the Trump administration has taken the most serious steps against Russia. Sanctions against seven Russian oligarchs and dozens of entities have been announced. But now it involves new charges along with new targets. Now, the US dislikes more than just the Kremlin's policies towards Ukraine and Syria. The head of the US Treasury Department said that Russia was committing "malign activity" seeking to undermine Western democracies. At the same time, sanctions affected businessmen, heads of state companies, bankers who tried to strengthen economic ties with the West. For example, Andrei Kostin, VTB Bank CEO, annually participated in Washington IMF sessions. Now he's not allowed in the US. Using remote satellite communications, Kostin explains to US journalists why the policy of sanctions itself is erroneous. Andrei Kostin: "It shows that the US administration largely misunderstands Russia's intentions and policies. It's regrettable. We need to stop, we go from bad to worse. We must stop if not for our sake, but for the sake of our children who deserve a better, peaceful life". Seven of the sanctioned businessmen didn't do anything to America. Among them are Viktor Vekselberg and Oleg Deripaska. Sanctions were imposed on their companies too: Renova, Rusal, GAZ Group and others. The US Treasury said the businessmen benefit from Russia's policies, which Washington doesn't like. Oleg Deripaska: "This morning's events are very unpleasant, but not unexpected. Of course, my being included in the US's sanction list is ungrounded, ridiculous and absurd". Regarding Rosoboronexport, it's obvious. Russia is one of the leaders on the arms market, so the US sanctions against this company are also a way to get rid of a competitor. Washington openly declared that they're putting pressure on countries that are plan on buying Russian military products. The situation on the natural gas market is similar. The US is pushing its liquefied gas towards Europe, trying to undermine Gazprom's biggest projects in years. So, Alexey Miller, CEO, is surprised that he was put on the sanctions list only now. It also includes 17 people who hold or used to hold top government positions, both in the executive and the legislature. Now US sanctions affect Senator Konstantin Kosachev, Andrei Skoch, a deputy in the Russian State Duma, Alexey Dyumin, the governor of the Tula region, Mikhail Fradkov, former Prime Minister, Viktor Zolotov, the director of the National Guard of Russia. Officials don't bother about freezing their assets as the Russian legislation prohibits them from having accounts and property abroad. Sanctions lists are also useless if they aim to block someone's work. Take Nikolai Patrushev, secretary of the Russian Federation Security Council, for instance. Nikolai Patrushev: "I am already on other lists, and yet we are actively engaged in international activity, which I think we're doing effectively. I visit many countries, we hold bilateral meetings, work at the bilateral level, we conduct multilateral events. For example, a Security Council is holding one in Sochi from April 24th-26th I hope to see about 100 countries represented. So, I think it's up to them". The US Treasury, which formally introduces sanctions, is a stone's throw away from the White House. Of course, it was the latter that gave a green light to it. Sara Sanders, the White House spokesperson: "Today’s sanctions and the totality of the administration’s actions, which are in keeping with Congress’s wishes, prove the President is absolutely correct when he says no one has been tougher on Russia". The toughness of the head of the White House is deliberate. Soon, he will have to give evidence to Mueller, the special counsel. Trump is still suspected of colluding with the Kremlin, which makes him as hamstrung as no US President ever was. - Will the President finally win over the Democrats after his resolute actions? Stephen Cohen, historian: "They keep telling him to get tougher, approaching the point of no return. Trump's relationship with Russia is endangered. For example, he wants to discuss international terrorism and the new arms race with Putin but if he calls Putin and says: "Let's talk" his critics will say it's treason". Concerning possible negotiations between the two leaders, Donald Trump still wants to meet with Vladimir Putin, according to the administration. But the background for a meeting and the conditions for a dialogue are degrading day by day, which doesn't look like a coincidence. 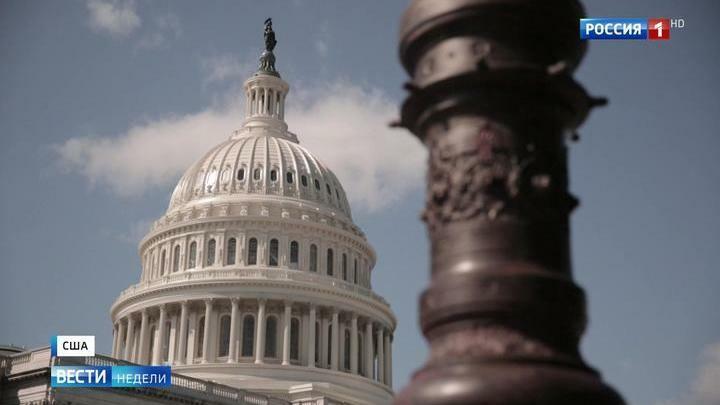 for Vesti — News of the Week from Washington, the USA.